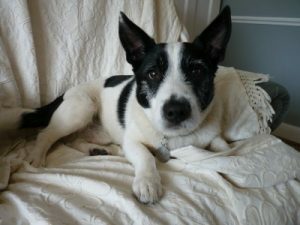 A new entry for Keep Your Pet has recently been published in the “Charities” section of the Purple Pages directory, so Bish dot net thought residents might like to know a bit more about it. Keep Your Pet is a scheme that results from a collaboration between Age UK York, Age UK Selby and the RSPCA York Harrogate and District. The scheme aims to provide a short term solution for older or vulnerable pet owners in the York and Selby area, providing services to enable the pet owner to cope with a health or other emergency without the additional worry of having to organize care for their pets. The services include fostering, sitting, walking or feeding any kind of domestic pet. A local couple, Steve and Dee Marshall, got involved with KYP after their beloved cat died and the house seemed very empty. They volunteered to be pet fosterers and fostered Ben on 3 separate occasions. Sadly his owner died and Ben finished up in RSPCA. When they heard of this they offered to adopt him permanently and he’s now been living happily with them for 3 years. They’re both keen to promote the charity and help more people to benefit from the services, as well as raising awareness and hopefully attracting more foster carers and volunteers. Steve is a member of the Alterego ceilidh band, and will be performing with the band in a fundraising event at Bishopthorpe Social Club on 21st October. More details of the event will follow nearer the time, meanwhile save the date! If you’d like to know more about Keep Your Pet, see the details here and also take a look at the Purple Pages entry here.